To help ensure a proper exposure, your Nikon D3100, D5100, or D7000 continually meters the light until the moment you depress the shutter button fully. In autoexposure modes, it also keeps adjusting exposure settings as needed to maintain a good exposure. For most situations, this approach works great, resulting in the right settings for the light that’s striking your subject at the moment you capture the image. But on occasion, you may want to lock in a certain combination of exposure settings. For example, perhaps you want your subject to appear at the far edge of the frame. If you were to use the normal shooting technique, you’d place the subject under a focus point, press the shutter button halfway to lock focus and set the initial exposure, and then reframe to your desired composition to take the shot. The problem is that exposure is then recalculated based on the new framing, which can leave your subject under- or overexposed. The easiest way to lock in exposure settings on your Nikon DSLR is to switch to M (manual) exposure mode and use the f-stop, shutter speed, and ISO settings that work best for your subject. But if you prefer to stay with an autoexposure mode, you can press the AE-L/AF-L button to lock exposure before you reframe. This feature is known as autoexposure lock, or AE Lock for short. Set the metering mode to spot metering. Select the option via the Quick Settings screen. If autofocusing, set the Focus mode to AF-S and the AF-Area mode to Single Point. Use the Quick Settings screen to select both settings. Frame the subject so that it falls under one of the focus points, and then use the Multi Selector to select that point. You sometimes need to press the shutter button halfway and release it to activate the exposure meters before you can do so. As you press the Multi Selector to cycle through the focus points, the currently selected point flashes red. 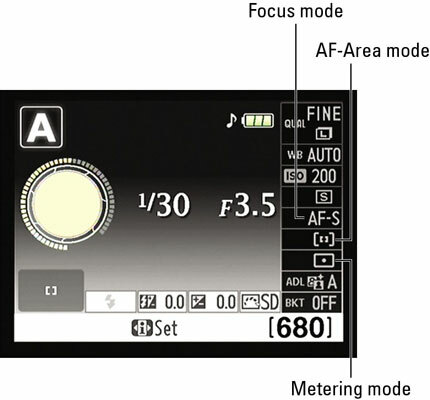 In spot metering mode, the focus point determines the area used to calculate exposure, so this step is critical whether you use autofocusing or manual focusing. The camera sets the initial exposure settings. If you’re using autofocusing, focus is also set at this point. For manual focusing, twist the focusing ring on the lens to bring the subject into focus. Press and hold the AE-L/AF-L button. This button’s just to the right of the viewfinder on the Nikon D3100 and D7000. It’s to the left of the Command dial on the D5100. While the button is pressed, the letters AE-L appear at the left end of the viewfinder to remind you that exposure lock is applied. By default, focus is locked at the same time if you’re using autofocusing. You can change this behavior by customizing the AE-L/AF-L button function. Reframe the shot if desired and take the photo. Be sure to keep holding the AE-L/AF-L button until you release the shutter button! And if you want to use the same focus and exposure settings for your next shot, just keep the AE-L/AF-L button pressed.